Love your sole-ful writing. Not to mention the gallery–though I can’t concentrate. Now that I’ve seen them, I’m jonesing for those black and white peep toe spectators. Thank you Shawne. I know, aren’t those just adorable?! Nancy, youve maintained your high standards for humor, maybe even raised the bar. What’s the title of the book? Maybe “The First Tango in Hoboken”? Thank you Uncle Malcolm. The humor is courtesy of the Green Brothers. Love the title too! All true! Craving the purple Comme Il Faut pair with the silver straps! Thanks for the info Nancy! 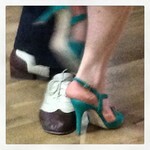 The milongueros of Buenos Aires don’t care about women’s shoes aside from serving you well for dancing. They don’t see them. They’re more concerned that you surrender to their embrace and know the music. 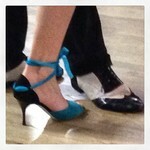 There are women who wear the same black pair of shoes every week (me included) to the same milonga. They wear comfortable clothing and a smile. Glitzy shoes and embellishments will get attention from the sidelines and send a clear message: I’m a tourist. You will discover a new world of tango in Buenos Aires.